The Embraer Legacy 600 is a business jet derivative of the Embraer ERJ 145 family of commercial jet aircraft. 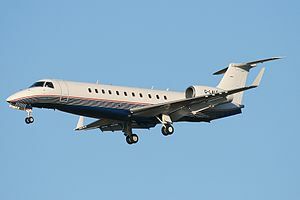 The Legacy 600 (market designation adopted after 2005) is based on the ERJ-135 model. It was launched in 2000 at the Farnborough Airshow as the "Legacy 2000". The Legacy carries 13 passengers in three partitioned sections for 3,050 nautical miles (5,650 km) or 8 passengers for 3,450 nautical miles (6,390 km). It features added range via extra fuel tanks in the tail behind the baggage compartment and forward of the wing, winglets, and an extensive drag reduction program. It is certified to 41,000 feet (12,000 m) altitude versus 37,000 feet (11,000 m) for the airline configuration. The Legacy Shuttle can seat 19 to 37 in airline-style seats but without the range. The first flight was made in June 2000, with the prototype of the ERJ-135 (PT-ZJA). This same aircraft was once the prototype of the first ERJ-145. New winglets and new wing-to-fuselage fairing was added, but no additional fuel tanks were available. The new fuselage fuel tanks were ready for the second prototype (PT-XJO), along with engine and avionics, that flew only in March 31st 2001. It was the second Embraer model to feature winglets, as the first were installed on the EMB-145SA military model. Embraer winglet models differed in shape and structure, due to their optimum design speed. The Legacy 600 competes on the upper end of the small to mid-sized range of business jets and is considered a "Super Midsize" aircraft. It has nearly the opposite design progression as the rival Canadair Challenger. The Legacy 600 was derived from the established ERJ family of regional jets, while the Canadair Regional Jet was developed by Bombardier from the Challenger business jet. Both lines of aircraft are competitors. Embraer has since launched an extensive lineup of business aircraft, from the entry-level Phenom 100 to the Lineage 1000, a bizliner version of the company's 100-seat E190. With the updated Mark I cockpit of the EMB-145, the Legacy includes a Honeywell Primus Elite avionics suite glass cockpit. Announced at the 2009 NBAA show, the Legacy 650 is a longer-range version of the Legacy 600, giving it a range capability of 7,220 km (3,900 nmi) non-stop with four passengers, or carry 1,134 kg more than the 600 for a 6,290 km trip. It features also a lowered alley, with increased headroom and it was certified by the FAA in February 2011. 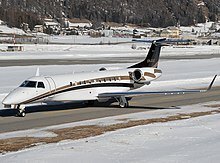 Embraer had a joint venture with Aviation Industry Corp. in China assembling Legacy 650 and ERJ-145 for thirteen years. An enhanced version, the 650E, was announced at the 2016 NBAA and scheduled for introduction in 2017. It includes a synthetic vision system and autothrottle as standard, a restyled three-zone interior and comes with a 10-year or 10,000-flight-hour warranty. On 29 September 2006, an ExcelAire Legacy (registered N600XL) collided with Gol Transportes Aéreos Flight 1907 Boeing 737 while cruising over the northern state of Mato Grosso, Brazil. The Boeing crashed to the ground and all 154 passengers and crew were killed, while the Embraer jet, despite serious damage to the left horizontal stabilizer and left winglet, was able to continue flying and managed to land at a Brazilian military airfield (Cachimbo Air Force Base). ^ 4 pax, LRC, NBAA IFR res. ^ a b "10 years of Executive Aviation" (PDF). The Embraer Advantage (Press release). Embraer. April 2011. p. 4. ^ a b "2017 Annual Report" (PDF). General Aviation Manufacturers Association. p. 17. Retrieved 2018-04-10. ^ Molly McMillin (Nov 1, 2016). "Embraer Launches $25.9 Million Legacy 650E". ShowNewsn. Aviation Week. ^ "Primus Elite improves safety and flexibility for Legacy 600 operator" (Press release). Honeywell. June 24, 2015. ^ "NBAA 09: Embraer joins the '650' club". FlightGlobal. 19 October 2009. ^ "USA gives thumbs-up to Legacy 650". FlightGlobal. 28 February 2011. ^ Trautvetter, Chad (6 Jun 2016). "Embraer To Close Legacy 650 Assembly Facility in China". AIN Online. Retrieved 21 October 2017. ^ "NBAA: Embraer unveils new version of Legacy 650". FlightGlobal. 31 October 2016. ^ "Legacy 600 Brochure" (PDF). Embraer. ^ "Legacy 650 Brochure" (PDF). Embraer. ^ a b c "Business Jets Specification and Performance Data" (PDF). Business & Commercial Aviation. Aviation Week. May 2015. Wikimedia Commons has media related to Embraer Legacy. "Embraer Legacy 650 Operators Survey" (PDF). Business & Commercial Aviation. Aviation Week. July 2015.